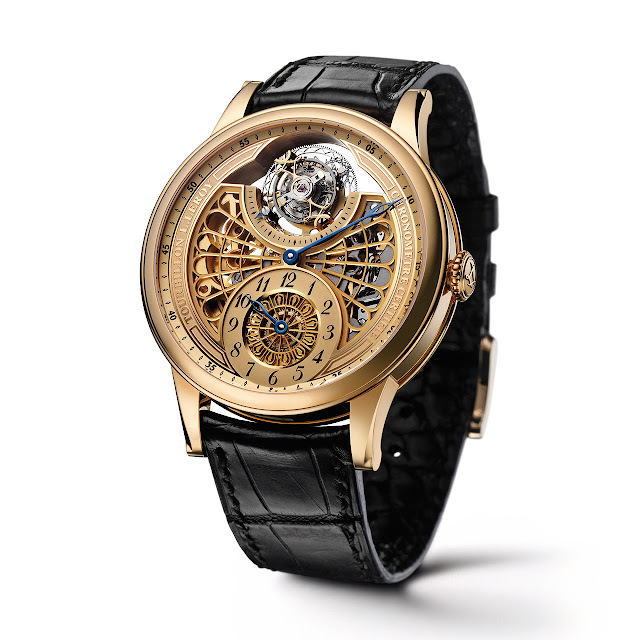 Leroy demonstrates the full measure of its expertise with the Automatic Tourbillon Regulator. A large flying tourbillon freely orbits at its summit, unobstructed by any bridge. Its heart is in diamond with an openworked structure. The pure technique behind this regulating organ ensures a degree of precision that is certified by Besançon Observatory. The entire movement, oscillating weight and dial of the Automatic Tourbillon Regulator have been delicately skeletonised and chamfered by hand. A meticulously fashioned rosette, with echoes of the early 1900s, adorns the off-centre hour dial, signalling the regulator configuration of this seven-piece limited series. Hand-finishing extends even to the heat-blued slender hands. Leroy respects the elegance and ornamentation of French style, matched by peerless standards of precision. Mechanical automatic, hand-skeletonised L512 calibre, chronometer certified by Besançon Observatory, 23 jewels, 28,800 vib/h, 22K gold oscillating weight, flying tourbillon with two balance springs, diamond escapement, 52-hour power reserve. Hours and minutes in a regulator configuration, seconds on the tourbillon. 18K pink gold, 41 mm. Anti-reflective sapphire crystals, front and back. Water-resistant to 50 metres (5 bar/165 ft). Skeletonised and chamfered by hand. Blued steel hands. Double-sided, hand-stitched black alligator, 18K pink gold buckle.